Michal Bilek takes charge of Kazakhstan for the first time against Scotland. Picture: Getty. Kazakhstan head coach Michal Bilek is expecting a “much better” Scotland side than the one he overcame as Czech Republic boss on a painful night in Prague for the Tartan Army. Bilek led his country to a 1-0 European Championship qualifying victory in 2010 when opposite number Craig Levein, inset, employed a 4-6-0 formation. Scotland rarely attacked before eventually succumbing to a goal from one of a string of corners. 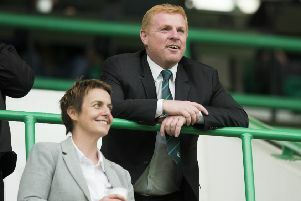 But Bilek was impressed with the attacking prowess of Alex McLeish’s team during their successful Nations League Group C1 campaign in the autumn, which culminated in winger James Forrest netting five goals in two wins over Albania and Israel. On his previous meetings with Scotland, Bilek said: “I remember the matches. The first game we won at home 1-0 and away it was a draw. I think Scotland have got better since then. “The current Scottish team is much better than the previous one because they have a lot of very fast players, especially wingers, and they deliver the ball into the box very quickly. century, and Kairat Almaty midfielder Bauyrzhan Islamkhan, who scored a sensational long-range strike against Aberdeen in the Europa League in 2015. But Bilek has the bonus of having former AC Milan and Watford midfielder Alexander Merkel available to him. The former Germany youth international, who moved from Kazakhstan aged six, has only played once for his native country, in 2015. His subsequent absence from squads remains something of a mystery in Kazakhstan but Bilek has persuaded the 27-year-old Heracles player to join up for the start of this Euro 2020 qualifying campaign. Bilek said: “He is very talented. He plays every match in Holland, he has a good understanding of the game and his passing is very good. “He is now one of the best players for his club and he has very good stats in the Dutch championship.